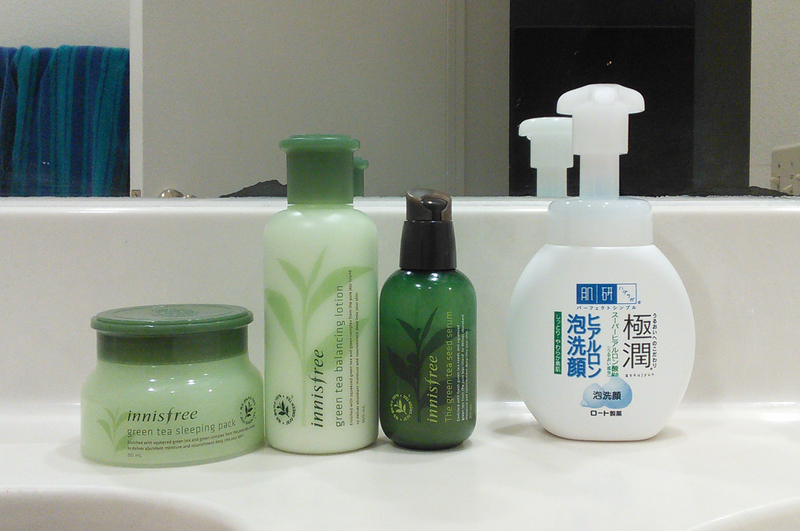 My other half will be hydrating his skin and protecting it from free radical damage with the Innisfree Green Tea line. Not pictured: Innisfree Green Tea Balancing Skin. Some COSRX will get in the mix eventually, too. I’ve always thought it’s awesome when men care about their skin. Now I think the already awesome Mr Crazy Snail Lady is even more awesome. What do you think about men and skincare? First of all, please extend my heartiest congratulations to Mr. Crazy Snail Lady. He is absolutely doing the right thing and, providing he keeps it up, he will not regret it. As the years pass, he will begin to see an enormous difference in the way his skin looks and feels compared to his peers who don’t have a regular skincare routine. He should – hopefully – also come to enjoy doing his routine, as you do – and I do. As far as the general issue of men and skincare is concerned, I think it is high time more men took proper care of their skin. I certainly would welcome this, and if far more men had regular routines, there would be far more – and better – products for men to use. You certainly see this in Korea and certain other parts of Asia where it is now quite common for men to use all manner of so-called “beauty” products. As a result, Asian skincare products for men are far more numerous and far better than most western men’s products. I know this from extensive personal experience over many years with all manner of men’s (and “other”) skincare products. As with your husband, it was my wife who got me started using skincare products. More than 30 years ago, I complained to her that my glasses would literally slide down my nose because of all the oil on my nose. She told me – and I will never forget it – “you could do with properly washing your face twice a day”. Who knew? I had no idea that there were actual facial cleansers. I had no idea what my skin type was or that there were even various different skin types. She gave me hers to try and I really liked it. The initial and immediate results were quite positive in many ways, so I was “hooked” and started my own personal journey to learn more and develop a personal routine that was best suited for me. This was a lot harder to do back then than it is today. Thank you for sharing this. It made staying up late on a Saturday night quite worth it. That’s fantastic! I ordered a second set of those Innisfree samples in the hopes of finding something my husband will tolerate. It took years to convince him that sunscreen was worth the effort. That’s awesome! My SO is tolerant to my skincare needs and will even try things out if I ask him to, but he doesn’t care enough to actually do a whole routine. He DID love my Banila Co Clean It Zero! cleanser when I tried it on him last night and it melted away just about all his stage makeup, though. Unfortunately, he still gives me crap for how weird sheet masks look, LOL. I love when men adopt a skin care routine. It involves admitting that of COURSE they care how they look! Everyone does! And men are very responsive to sensory luxuries–beauty, softness, good smells, all of that. It is lovely to see the pleasure a man takes in the small luxury of applying a few products to his skin, and the genuine joy he gets seeing himself look better. It also helps them to understand us better and to appreciate the effort we put into taking care of ourselves. Looking good, but where’s the sunscreen yo? He likes it a lot. I think it’s one of his favorite parts of his routine! I can tell you right now that no matter how many times I have tried to get my girlfriend into skincare, she will never leave her cocoa butter – and why would she, her skin looks fantastic, so glow-y and smooth that people have called it “natural highlighting”. If I used the thing anywhere near my face I would break out in seconds, but it’s the only skincare product that’s ever worked for her – anything more complicated, even if 100% natural, will give her spots or just won’t be hydrating enough. I’m comparing her to the whole “men and skincare” theme because I know men who wear more cosmetics and skincare products than her. She never wore a smidge of make-up in her life apart from this one time I gave her a feline flick that suited her eyes amazingly (her personality, not so much). Gotta love Afro-Caribbean genes!